[Spee] joined the Imperial German Navy in 1878. Between 1887 [and] 1888, [he] commanded the Cameroon ports, a German colony. Prior to the declaration of war in 1914 he held various responsible positions relating to weapons development until, in 1908, he was appointed Chief of Staff on the North Sea Command, rising to Rear Admiral in 1910. Two years later, in 1912, he was given command of the German East Asian Cruiser Squadron. From the outbreak of war Spee's squadron concentrated on destroying British merchant and troop shipping, enjoying great success. At the Battle of Coronel on 1 November 1914 off the coast of Chile, Spee sunk two British cruisers under the command of Sir Christopher Cradock, outclassing the British in terms of both gunnery and seamanship. Embarrassed by the defeat, the Royal Navy determined to chase down and destroy Spee's squadron. At the Battle of the Falkland Islands, on 8 December 1914, Spee attempted a raid upon British wireless and coaling facilities at Port Stanley. Unbeknownst to Spee however, a British squadron, including two fast, modern battle cruisers, Invincible and Inflexible, were at that same time coaling at Port Stanley, sent by First Sea Lord Admiral Fisher to reverse the British defeat at Coronel, commanded by Vice Admiral Frederick Sturdee. Heavily outgunned, six German ships—including Spee's own flagship, Scharnhorst - were sunk, with some 2,200 sailors drowned, among them Spee. Ritter von Greim, born 22-06-1892, in Bayreuth, was an army cadet before World War I and initially served in the artillery before transferring to the German Air Service (Fliegertruppe) in 1915. In June 1918, Greim had an encounter with a Bristol Fighter, and his aircraft lost its cowling. This struck and damaged his top wing, along with the lower left inter-plane strut, but he managed to land the machine successfully. He returned to Jasta 34 in October 1918, the unit which had been commanded by Manfred von Richthofen . . . until his death in action on April 21. [Greim] was awarded . . . the Bavarian Military Order of Max Joseph. This latter award made him a Knight (Ritter) and allowed him to add both this honorific title and the style 'von' to his name. Thus Robert Greim became Robert Ritter von Greim. After the war, Ritter von Greim was unsuccessful in finding a place in the Reichswehr was asked by Chiang Kai-Shek's . . . government to come to Canton, China to help build a Chinese air force. Before the Nazis came to power, von Greim realized that his proper place was not in the expatriate community in China, but in Germany, and he returned to his native country. In 1933, Ritter von Greim was asked by Hermann Goering . . . to help rebuild the German Air Force and in 1934 was appointed to the command of the pilot school. Ritter von Greim was given command of a Luftflotte, Air Fleet and was involved in the invasion of Poland, the Battle for Norway, the Battle of Britain and Operation Barbarossa . . . .
Ritter von Greim's greatest tactical achievement was his Luftflotte's involvement in the battle of Kursk. On 26-04-1945, when Soviet forces had reached Berlin and the Reich was all but doomed, Generaloberst Ritter von Greim flew into Berlin from Munich with the noted female pilot Hanna Reitsch . . . in response to an order from Hitler. They kept repeating "It was the blackest day when we could not die at our Führer's side." Hitler promoted Ritter von Greim to Generalfeldmarschall, making him the last German officer to achieve that rank, and then appointed him head of the Luftwaffe to replace Hermann Göring. On 28.04.1945, Hitler ordered Ritter von Greim to leave Berlin and have Reitsch fly him to Plön so that he could arrest Heinrich Himmler . . . for treason. 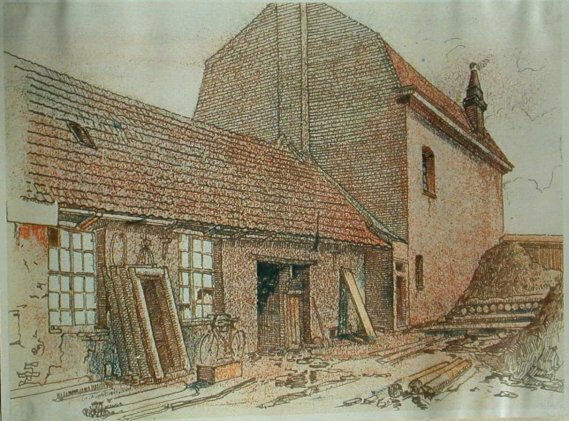 A student at the University of Munster, Remarque was drafted into the German army at the age of 18. He fought on the Western Front during World War I and was wounded no fewer than five times, the last time seriously. After the war, he worked various jobs—teacher, stonecutter, race-car driver, sports journalist—while working to complete the novel he had had in mind since the war. 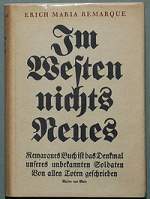 Published in Germany in 1929 as Im Westen Nichts Neues, it sold 1.2 million copies within a year; the English translation, All Quiet on the Western Front, published the same year, went on to similar success. 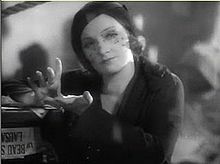 It was subsequently translated into 12 languages, and made into a celebrated Hollywood film in 1930. The smashing success of All Quiet on the Western Front was due in large part to its reflection of a widespread disillusionment with the war that took hold of many during the 1920s. Praised as a novel of unyielding realism, All Quiet on the Western Front described in stark detail the physical trauma of war. Remarque also articulated the numbing frustration and anger of the conscript soldier, sent into battle by government and military leaders for reasons of politics and power that he struggled to understand. In the words of his protagonist, Paul Baumer: I see how peoples are set against one another and in silence, unknowingly, foolishly, obediently, innocently slay one another. I see that the keenest brains of the world invent weapons and words to make it yet more refined and enduring. The celebrated American journalist H. L. Mencken called All Quiet on the Western Front "unquestionably the best story of the World War." Both the book and the 1930 film version were banned by the Nazis after their rise to power in Germany in 1933 as prejudicial to German national prestige. Remarque went on to write nine more novels, all dealing with the horror and futility of war and the struggle to understand its purpose; his last novel, The Night in Lisbon, was unsparing in its condemnation of World War II as Adolf Hitler's attempt to perpetrate the extermination of Jews and other non-people on behalf of the master race. Though he became a naturalized American citizen and was during the 1930s a frequent participant in New York City nightlife and a companion for several years in Hollywood of the actress Marlene Dietrich, Remarque lived for most of his later life at Porto Rondo, on the shore of Lake Maggiore in Switzerland. George, the second son of Edward VII and Alexandra of Denmark, was born at Marlborough House on 3rd June, 1865. Most of his childhood was spent at Sandringham, Buckingham Palace, and Balmoral. After being educated at home by the Rev. J. N. Dalton, George became a naval cadet at Dartmouth. By 1889 he was commander of a torpedo boat. However, in January 1892, his naval career came to an end when his older brother, Prince Edward, died of pneumonia. Edward had been engaged to marry his German cousin, Princes Mary of Teck. It was now decided she should marry George instead. George was now heir to the throne and it was decided that he could no longer risk his life as a naval commander. He was granted the title: the Duke of York, and became a member of the House of Lords. George was also given a political education that included an in-depth study of the British Constitution. However, unlike his father, he did not learn to speak any foreign languages. George, Duke of York, married Princess Mary in 1893. Mary had six children: Edward VIII (1894-1972), George VI (1895-1952), Mary (1897-1965), Henry, Duke of Gloucester (1900-1974), George, Duke of Kent (1902-1942) and Prince John (1905-1919). Edward VII died in 1910 during the Liberal Government's conflict with the Lords. His father had promised to give his support to the reform of the House of Lords if Herbert Asquith and the Liberal Party won a General Election on this issue. 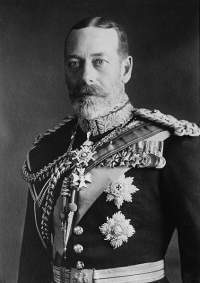 Although the 1910 General Election held in December did not produce a clear victory for the Liberals, George V agreed to keep his father's promise. When the House of Lords attempted to stop the passage of the 1911 Parliament Act, George V made it clear he was willing to create 250 new Liberal peers in order to remove the Conservative majority in the Lords. Faced with the prospect of a House of Lords with a permanent Liberal majority, the Conservatives agreed to let the 1911 Parliament Act become law. The outbreak of the First World War created problems for the royal family because of its German background. Owing to strong anti-German feeling in Britain, it was decided to change the name of the royal family from Saxe-Coburg-Gotha to Windsor. To stress his support for the British, the king made several visits to the Western Front. On one visit to France in 1915 he fell off his horse and broke his pelvis. In 1917 George V took the controversial decision to deny political asylum to the Tsar Nicholas II and his family after the Bolshevik Revolution . People were shocked by George's unwillingness to protect his cousin but his advisers argued that it was important for the king to distance himself from the autocratic Russian royal family. Some people questioned this decision when it became known that the Bolsheviks had executed Tsar Nicholas, his wife and their five children. In 1924 George V appointed Ramsay MacDonald, Britain's first Labour Prime Minister. Two years later he played an important role in persuading the Conservative Government not to take an unduly aggressive attitude towards the unions during the General Strike. It an attempt to achieve national harmony during the economic crisis of 1931, the king persuaded MacDonald to lead a coalition government. The following year George V introduced the idea of broadcasting a Christmas message to the people. The king had not enjoyed good health for a long time and during his final years he spent much of his time on his grand passion, philately. 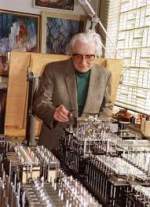 Patriotically, he concentrated on collected stamps from the British Empire. Lemberg is occupied by Austrian-German forces. The first attack occurred at 10.30 p.m. on June 22nd. What gives it a peculiar and disturbing significance is that our ships were set upon at a point well on this side of the rendezvous, in a part of the Atlantic which might have been presumed free from submarines. The attack was made in force, and although the night made it impossible to arrive at an exact count, it was clear that the U-boats had gathered for what they deemed would be a slaughter. The heavy gunfire of the American destroyers scattered the submarines. It is not known how many torpedoes were launched, but at least five were counted. The second attack was launched a few days later against another contingent, the point of attack being beyond the rendezvous. Not only did the destroyers hold the U-boats at a safe distance, but their speed resulted in the sinking of at least one submarine. Grenades were used, firing a charge of explosives timed to go off at a certain distance under water. In one instance the wreckage covered the surface of the sea after a shot at a periscope, and reports claim that the boat was sunk. Being the only party in the Reichstag to have voted against the Enabling Act (with the Communist Party prevented from voting), the SPD was banned in the summer of 1933 by the new Nazi government. Many of its members were jailed or sent to Nazi concentration camps. An exile organization was established first in Prague. Others left the areas where they had been politically active and moved to other towns where they were not known. Boys and girls, look back a little more than 10 years ago. A great war—the World War—had raged over the peoples of the earth and had left in the end a heap of ruins. Only one people remained victorious in that dreadful war, a people of whom Christ said that its father is the Devil. That people had ruined the German Nation in body and soul. At that time Adolf Hitler, an unknown man, arose from among the people and became a voice which proclaimed a holy war and struggle. He cried to the people to take courage again and to rise and join in liberating the German people from the Devil, so that mankind might again be free from that race which has roamed the globe for centuries and millennia, marked with the brand of Cain. Boys and girls, even if it is said that the Jews were once the chosen people do not believe it, but believe us when we say that the Jews are not a chosen people. Because it cannot be that a chosen people should act among the peoples as the Jews do today. 1939 Holocaust: Slovakia: Minister of Propaganda Aleksander Mach proclaims that within a year Slovakia will be cleansed of Jews. On this day in 1941, over 3 million German troops invade [the Soviet Union] in three parallel offensives, in what is the most powerful invasion force in history. Nineteen panzer divisions, 3,000 tanks, 2,500 aircraft, and 7,000 artillery pieces pour across a thousand-mile front as Hitler goes to war on a second front. Despite the fact that Germany and [the Soviet Union] had signed a "pact" in 1939, each guaranteeing the other a specific region of influence without interference from the other, suspicion remained high. When the Soviet Union invaded Rumania in 1940, Hitler saw a threat to his Balkan oil supply. He immediately responded by moving two armored and 10 infantry divisions into Poland, posing a counter-threat to [the Soviet Union]. But what began as a defensive move turned into a plan for a German first-strike. Despite warnings from his advisers that Germany could not fight the war on two fronts (as Germany's experience in World War I proved), Hitler became convinced that [Britain] was holding out against German assaults, refusing to surrender, because it had struck a secret deal with [the Soviet Union]. Fearing he would be "strangled" from the East and the West, he created, in December 1940, "Directive No. 21: Case Barbarossa": the plan to invade and occupy the very nation he had actually asked to join the Axis only a month before! By the end of the first day of the invasion, the German air force had destroyed more than 1,000 Soviet aircraft. And despite the toughness of the [Soviet] troops, and the number of tanks and other armaments at their disposal, the Red Army was disorganized, enabling the Germans to penetrate up to 300 miles into [Soviet] territory within the next few days. 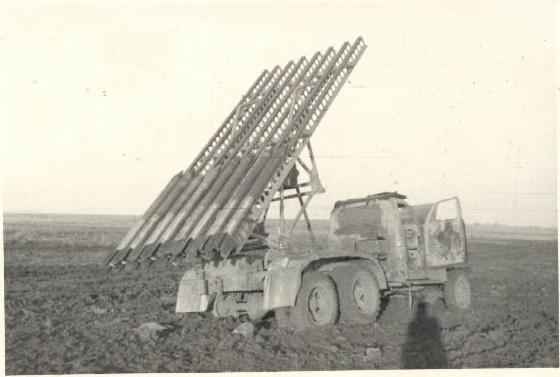 Wunderwaffen: Testing with various rocket launching systems are conducted by the Soviet RNII throughout 1940, with the BM-13 (with launch rails for sixteen rockets) ultimately being authorized for production. Forty launchers are ready for deployment at the start of Operation Barbarossa. After long months when I was forced to keep silent, despite heavy concerns, the time has come when I can finally speak openly. When the German Reich received England's declaration of war on 3 September 1939, the British attempted once again to frustrate any attempt to begin a consolidation, and thus a strengthening, of Europe by fighting the then strongest power on the Continent. England formerly destroyed Spain through many wars. For the same reason it waged its wars against Holland. With the help of all of Europe it later fought France. And around the turn of the century, it began to encircle the German Reich and it began the World War in 1914. Germany was defeated in 1918 only because of its inner disunity. The results were terrible. After first hypocritically declaring to be fighting only against the Kaiser and his regime, they began the systematic destruction of the German Reich after the German army had laid down its arms. As the prophecy of a French statesman, who had said that there were twenty million Germans too many, began to be fulfilled through starvation, disease, or emigration, the National Socialist movement began building the unity of the German people, thereby preparing the rebirth of the Reich. This new revival of our people from poverty, misery, and shameful contempt was a sign of a pure internal rebirth. England was not affected, much less threatened, by this. 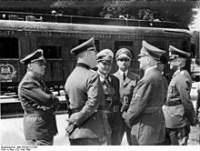 Nonetheless, it immediately renewed its hateful policy of encirclement against Germany. Both at home and abroad, we faced the plot we all know about between Jews and democrats, Bolshevists and reactionaries, all with the same goal: to prevent the establishment of a new people's state, to plunge the Reich again into impotence and misery. The hatred of this international world conspiracy was directed not only against us, but also against those peoples who also had been neglected by Fortune, who could earn their daily bread only through the hardest struggle. Italy and Japan above all, alongside Germany, were almost forbidden to enjoy their share of the wealth of the world. The alliance between these nations was, therefore, only an act of self-defense against a threatening, egotistical world coalition of wealth and power. As early as 1936, according to the testimony of the American General Wood to a committee of the American House of Representatives, Churchill had said that Germany was becoming too strong again, and that it therefore had to be destroyed. In summer 1939, England thought that the time had come to renew its attempts to destroy Germany by a policy of encirclement. Their method was to begin a campaign of lies. They declared that Germany threatened other peoples. They then provided an English guarantee of support and assistance, next, as in the World War, let them march against Germany. Thus between May and August 1939, England succeeded in spreading the claim throughout the world that Germany directly threatened Lithuania, Estonia, Latvia, Finland, Bessarabia, and even the Ukraine. Some of these nations allowed themselves to be misled, accepting the promises of support that were offered, and thereby joined the new attempt to encircle Germany. Under these circumstances, I believed that I was called by my conscience, and by the history of the German people, to assure not only these nations and their governments that these British accusations were untrue, but also to reassure the strongest power in the East through formal declarations that our interests did not conflict. You probably all felt that this was a bitter and difficult step for me. The German people have never had hostile feelings toward the peoples of Russia. During the last two decades, however, the Jewish-Bolshevist rulers in Moscow have attempted to set not only Germany, but all of Europe, aflame. 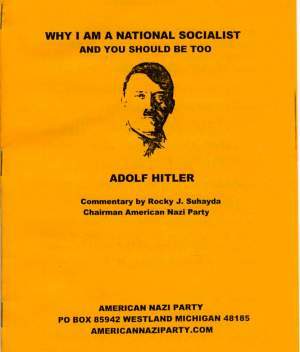 Germany has never attempted to spread its National Socialist worldview to Russia. Rather, the Jewish-Bolshevist rulers in Moscow have constantly attempted to subject us and the other European peoples to their rule. They have attempted this not only intellectually, but above all through military means. The results of their efforts, in every nation, were only chaos, misery, and starvation. I, on the other hand, have tried for two decades to build a new socialist order in Germany, with a minimum of interference and without harming our productive capacity. This has not only eliminated unemployment, but also the profits of labor have flowed increasingly to working people. The results of our policies are unique in all the world. Our economic and social reorganization has led to the systematic elimination of social and class barriers, with the goal of a true people's community. It was, therefore, difficult for me in August 1939 to send my minister to Moscow to attempt to work against Britain's plans to encircle Germany. I did it only because of my sense of responsibility to the German people, above all in the hope of reaching a lasting understanding and perhaps avoiding the sacrifice that would otherwise be demanded of us. With the exception of Lithuania, Germany declared that those areas and nations were outside Germany's political interests. There was a special provision in the case that England succeeded in inciting Poland into war against Germany. But here, too, German claims were moderate, and in no relation to the accomplishments of German arms. The results of the treaty, which I sought in the interests of the German people, were particularly severe for Germans living in the affected nations. Over half a million German people's comrades—all of them small farmers, craftsmen, and workers—were forced, almost overnight, to leave their former homes to escape a new government that threatened them with vast misery, and sooner or later, with complete extermination (Ausrottung). Even so, thousands of Germans disappeared! It was impossible to learn what had happened to them, or even where they were. More than 160 of them were men holding German citizenship. I kept silent about all this, because I had to keep silent! My wish was for final agreement with this state, and if possible a lasting settlement. But even during our march into Poland, in violation of the treaty, the Soviet rulers suddenly claimed Lithuania. The German Reich never intended to occupy Lithuania, and never made any such demand on Lithuania. To the contrary, it turned down the request by the Lithuanian government to send German troops there, since that did not correspond to the goals of German policy. Nonetheless, I accepted this new Russian demand. But that was only the beginning of ever new demands. The victory on Poland, gained exclusively by German troops, gave me the occasion to extend a new offer of peace to the Western powers. It was rejected by the international and Jewish warmongers. The reason was that England still hoped to mobilize a European coalition against Germany that would include the Balkans and Soviet Russia. Those in London decided to send Ambassador Cripps to Moscow. He has clear orders to improve relations between England and Soviet Russia, and to develop them along lines England wanted. The English press reported on the progress of his mission, as long as they were not silent for tactical reasons. The first results were evident in fall 1939 and spring 1940. Russia justified its attempts to subject not only Finland, but also the Baltic states, by the sudden false and absurd claim that it was protecting them from a foreign threat, or that it was acting to prevent that threat. Only Germany could have been meant. No other power could enter the Baltic Sea, or wage war there. I still had to remain silent. The rulers of the Kremlin continued. Consistent with the so-called friendship treaty, Germany removed its troops far from its eastern border in spring 1940. 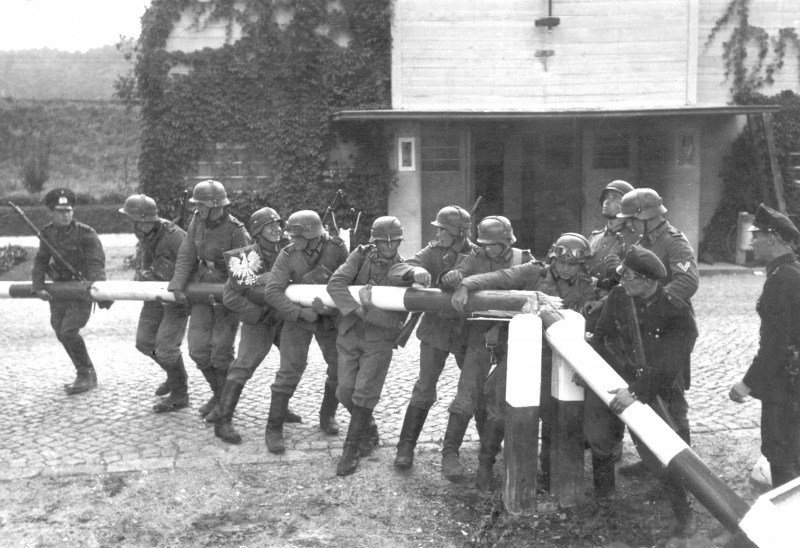 Russian forces were already moving in, and in numbers that could only be seen as a clear threat to Germany. According to a statement by Molotov, there were already 22 Russian divisions in the Baltic states in spring 1940. Although the Russian government always claimed that the troops were there at the request of the people who lived there, their purpose could only be seen as a demonstration aimed at Germany. As our soldiers attacked French-British forces in the west, the extent of the Russian advance on our eastern front grew ever more threatening. In August 1940, I concluded that, given the increasing number of powerful Bolshevist divisions, it was no longer in the interests of the Reich to leave the eastern provinces, so often devastated by war, unprotected. This, however, is exactly what the British and Soviets had hoped. The fact that so much of the German forces, in particular the air force, was tied down in the east made it impossible for the German leadership to bring a radical end to the war in the West. This was the goal of both British and Soviet Russian policy. Both England and Soviet Russia wanted to prolong this war as long as possible in order to weaken all of Europe and plunge it into ever greater impotence. Russia's threatened attack on Rumania was intended not only to take over an important element in the economic life not only of Germany, but of Europe as whole, or at least to destroy it. With boundless patience, the German Reich attempted after 1933 to win over the southeastern European states as trading partners. We, therefore, had the greatest possible interest in their domestic stability and order. Russia's entrance into Rumania and Greece's ties to England threatened to rapidly transform this area into a general battleground. Despite our principles and customs, and despite the fact that the Rumanian government had brought on these troubles itself, I urgently advised them, for the sake of peace, to bow to Soviet extortion and cede Bessarabia. The Rumanian government, however, believed that it could justify this step to its own people only if Germany and Italy in return guaranteed the security of its remaining territory. I did this with a heavy heart. When the German government gives a guarantee, it will stand by it. We are neither English nor Jewish. I thus believed that I had saved peace at the last moment, even if at the cost of a heavy obligation. To reach a final resolution of these problems and to clarify Russian intentions toward the Reich, as well as under the pressure of steadily increasing mobilization along our eastern border, I invited Mr. Molotov to come to Berlin. Molotov's first question: Does Germany's guarantee for Rumania in the event of an attack mean war with Russia in the event of an attack Soviet Russia? My answer: The German guarantee is broad and obligates us absolutely. Russia has never told us that it has any interest in Rumania outside Bessarabia. The occupation of northern Bukowina was already a violation of this assurance. I therefore do not believe that Russia could have any further claims on Rumania. Molotov's second question: Russia feels itself threatened by Finland again. Russia is unwilling to tolerate this. Is Germany ready to provide no support for Finland, and above all to withdraw the German troops in Kirkenes? My answer: As in the past, Germany has no political interests in Finland. However, the German government cannot accept a new Russian war against the tiny Finnish people, particularly since we could never believe that Finland threatens Russia. However, we do not want war in the Baltic Sea. Molotov's third question: Is Germany willing for Soviet Russia to provide a guarantee to Bulgaria, and to send Soviet-Russian troops to Bulgaria for this purpose—although he (Molotov) wished to say that they did not have the intention of removing the king. My answer: Bulgaria is a sovereign state, and I did not know that, just as Rumania had asked for a German guarantee, Bulgaria has asked for one from Soviet Russia. I would also have to discuss the matter with my allies. Molotov's fourth question: Soviet Russia absolutely requires free passage through the Dardanelle, and also demands, for its protection, several important positions on the Dardanelle or along the Bosporus. Is Germany willing to agree to this or not? My answer: Germany is ready at any time to agree to changes in the Statute of Montreux that benefit the Black Sea states. Germany is not willing to approve Russian bases on the straights. I behaved as the responsible leader of the German Reich, but also as a responsible representative of European culture and civilization. The result was an increase in Soviet Russian activity against the Reich, above all the immediate beginning of efforts to subvert the new Rumanian state and an attempt to use propaganda to eliminate the Bulgarian government. With the help of confused and immature people, the Rumanian Legion succeeded in organizing a coup that removed General Antonescu and plunged the nation into chaos. By removing legal authority, they also removed the grounds for Germany to act on its guarantee. Still, I believed it best to remain silent. Immediately after this enterprise collapsed, there was a new increase in Russian troops along the German eastern border. Increasing numbers of tank and parachute divisions threatened the German border. The German army, and the German homeland, know that until a few weeks ago, there was not a single German tank or motorized division on our eastern border. If anyone needed final proof of the carefully hidden coalition between England and Soviet Russia, the conflict in Yugoslavia provided it. While I was making a last attempt to keep peace in the Balkans, and in agreement with the Duce invited Yugoslavia to join the Three Power Pact, England and Soviet Russia organized a coup that toppled the government that was ready for such an agreement. The German people can now be told that the Serbian coup against Germany was under both the English and Soviet Russian flags. Since we were silent, the Soviet Russian government went a step further. Not only did they organize a Putsch, but signed a treaty of friendship with their new lackeys a few days later that was intended to strengthen Serbia's resistance to peace in the Balkans, and turn it against Germany. It was no platonic effort, either. Moscow demanded that the Serbian army mobilize. Since I still believed that it was better not to speak, the rulers of the Kremlin took a further step. The German government now possesses documents that prove that, to bring Serbia into the battle, Russia promised to provide it with weapons, airplanes, ammunition, and other war material through Salonika. That happened at almost the same moment that I was giving the Japanese Foreign Minister Dr. Matsuoka the advice to maintain good relations with Russia, in the hope of maintaining peace. Only the rapid breakthrough of our incomparable divisions into Skopje and the capture of Salonika prevented the realization of this Soviet Russian-Anglo-Saxon plot. Serbian air force officers, however, fled to Russia and were immediately welcomed as allies. Only the victory of the Axis powers in the Balkans frustrated the plan of involving Germany in battle in the southeast for months, allowing the Soviet Russian armies to complete their march and increase their readiness for action. Together with England, and with the hoped for American supplies, they would have been ready to strangle and defeat the German Reich and Italy. Thus Moscow not only broke our treaty of friendship, but betrayed it! They did all this while the powers in the Kremlin, to the very last minute, hypocritically attempted to favor peace and friendship, just as they had with Finland or Rumania. I was forced by circumstances to keep silent in the past. Now the moment has come when further silence would be not only a sin, but a crime against the German people, against all Europe. Today, about 160 Russian divisions stand at our border. There have been steady border violations for weeks, and not only on our border, but in the far north, and also in Rumania. Russian pilots make a habit of ignoring the border, perhaps to show us that they already feel as if they are in control. During the night of 17-18 June, Russian patrols again crossed the German border and could only be repelled after a long battle. Now the hour has come when it is necessary to respond to his plot by Jewish-Anglo-Saxon warmongers and the Jewish rulers of Moscow's Bolshevist headquarters. At this moment, an attack unprecedented in the history of the world in its extent and size has begun. With Finnish comrades, the victors of Narvik stand by the Arctic Sea. German divisions, under the command of the conqueror of Norway, together with the heroes of Finland's freedom and their marshal, defend Finnish soil. On the Eastern Front, German formations extend from East Prussia to the Carpathians. From the banks of the Pruth River, from the lower Danube to the Black Sea, German and Romanian soldiers are united under state leader Antonescu. The purpose of this front is no longer the protection of the individual nations, but rather the safety of Europe, and therefore the salvation of everyone. 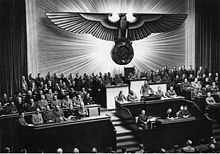 I have therefore decided today once again to put the fate of Germany and the future of the German Reich and our people in the hands of our soldiers. Lithuania: As Nazi Germany began its invasion of the Soviet Union, the Lithuanian Activist Front started an uprising to liberate Lithuania from Soviet occupation. 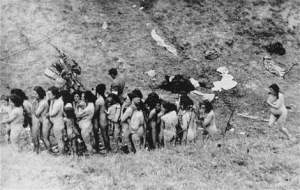 Poland: June 22-28: In Brygidki Prison, Lwow, the Soviets carry out mass executions. Of 13,000 mostly Polish inmates, all but 600 are executed. About 3,000 are Ukrainians. Polish leader Sikorski urges Churchill to take 'drastic' measures against German citizens in Allied countries and to launch large scale bombing of civilian targets in Germany, in retaliation for Nazi atrocities. United States: V-Mail (Victory-Mail) is sent for the first time. V-Mail uses a special paper for letter writing, designed to reduce cargo space taken up by mail sent to and from members of the armed services. The letters written on this special paper are opened at the post office, censored, and reduced in size by photography. One roll of film contains 1600 letters. 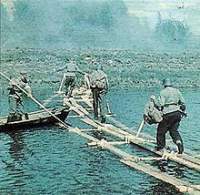 The Belorussian operation by the Red Army between 23 June and 29 August 1944 was the largest of WW II, resulting in the destruction of German Army Group Centre and the reconquest of what is now Belarus. Named after the Napoleonic war hero, and timed to begin on the third anniversary of the German invasion on 22 June (in fact it was a day late), the sense of grand opera reflected its scale. Four Fronts (army groups) were involved: first Baltic (Bagramyan), Third Belorussian (Chernyakovsky), Second Belorussian (Zakharov), and first Belorussian (Rokossovsky), totalling 1.4 million men. The Germans were in deeply echeloned defensive positions 155-68 miles (250-70 km) deep, with 1.2 million. The Soviets attacked simultaneously in six places along a 683 mile (1, 100 km) front, pushing west 342-73 miles (550-600 km). 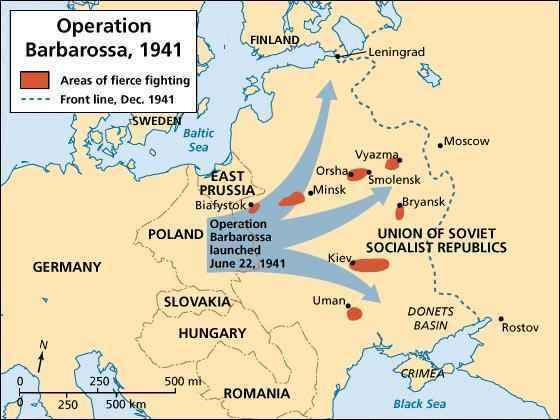 Minsk was recaptured on 3 July, and by 29 August the Red Army was close to Warsaw (see Warsaw uprising) and well into East Prussia. The Operations Staff agrees with the view taken in the letter of the army group judge to the Supreme Commander Southwest of 20 May 1944. The Fuehrer Order is to be applied even if the enemy employs only one person for a task. Therefore, it does not make any difference if several persons or a single person take part in a commando operation. The reason for the special treatment of participants in a commando operation is that such operations do not correspond to the German concept of usage and customs of warfare. War in the Air: The Luftwaffe launches a surprise night raid (60 aircraft) on the US 8th Air Force's shuttle base at Poltava in the Ukraine, destroying 44 B-17s and 500,000 gallons of fuel. 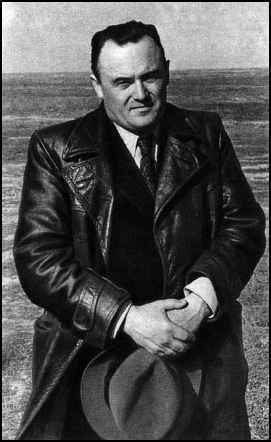 In the summer of 1944, when word reached London that the Germans might be developing a new rocket weapon, the V-2, to replace the V-1, (OBE research scientist Standish) Masterman went to Poland, via Tehran and Moscow, to study a rocket-firing installation abandoned by the Germans while retreating from a Russian attack. 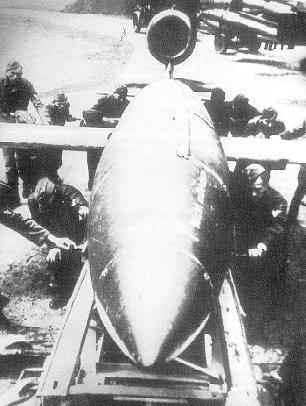 At the time, skeptics did not believe that Germans could launch a long-range rocket, even though portions of such a missile had been recovered in Sweden and Poland after misfires. The team of experts-British, American and Russian-assigned to the case were baffled when they first arrived at the captured launch site. The records of V-2 firings were missing. These would have provided the amounts of fuel, range and payload. A careful search of the site finally turned up the crucial missing documents. But these had "already been used as lavatory paper by German troops who had found themselves in short supply of that commodity in their precipitate retreat in the face of the Russian offensive. Nevertheless the task of decipherment had to be faced, and a painstaking but necessarily grisly restoration process finally confirmed that the rocket could reach London." Unexpectedly, the Russians proved to be the most squeamish participants in this dirty work of reconstruction. The British members of the delegation took a wry "the things we do for England" view of the unsavory but vital job. 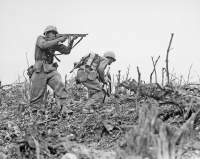 During World War II, the U.S. 10th Army overcomes the last major pockets of Japanese resistance on Okinawa Island, ending one of the bloodiest battles of World War II. The same day, Japanese Lieutenant General Mitsuru Ushijima, the commander of Okinawa's defense, committed suicide with a number of Japanese officers and troops rather than surrender. We finished von Papen and Speer and this morning we started von Neurath. Dr. von Ludinghausen: What did you know or what did you learn about concentration camps? When did you first hear of this institution at all, and when and from whom did you hear of the conditions which prevailed in these camps? Constantin von Neurath, white-haired and visually impressive, was carrying his seventy-four years with enough difficulty so that his counsel equipped him with written questions and answers. The lawyer, Dr Otto Freiherr von Ludinghausen, would have done better had he asked fewer questions and shortened the answers. Ludinghausen took his client through a long recital of his positions and actions during the course of German political history, larded with readings of excerpts from affidavits of a bishop, a baroness, and a former ambassador, all of whom extolled the defendant's wisdom and morals. The presentation went so slowly that Lawrence (The President) intervened repeatedly to stop irrelevancies and repetitions. Of course it was all lies. 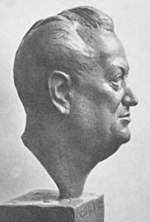 Hitler installed the Nazi Karl Hermann Frank as Neurath's Secretary of State and gave Himmler full authority over police and security matters. Neurath had to carry out orders from national agencies in Germany, many of which were intended to align Czech social and economic policies with those of the Reich. 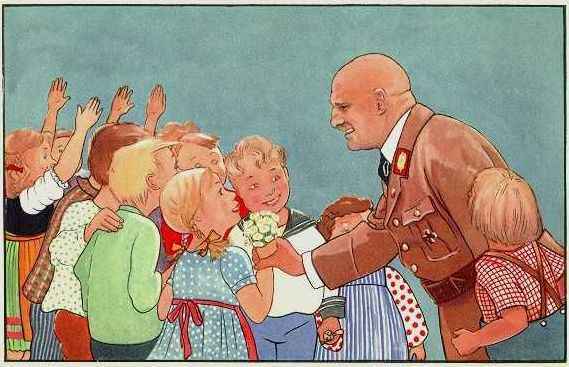 Thus the Nuremberg Laws and other anti-Semetic policies were introduced under Neurath's local authority. The Red Scare of the 1940s and 1950s famously ended the careers of numerous film-industry professionals and forced others to avoid blacklisting by repudiating their political beliefs and "naming names" of suspected Communist sympathizers to the House Committee on Un-Activities (HUAC). But Hollywood actors, directors and screenwriters were not the only victims of the Cold War anti-Communist purges in the entertainment industry. Prominent figures in the music industry were also targeted, including Leonard Bernstein, Aaron Copland, Lena Horne, Pete Seeger and Artie Shaw, all of whom were named publicly as suspected Communist sympathizers on this day in 1950, in the infamous publication Red Channels: The Report of Communist Influence in Radio and Television. Joining famous names like Orson Welles, Lillian Hellman, Arthur Miller and Dorothy Parker on the Red Channels list were the aforementioned Bernstein, Copland, Horne, Seeger and Shaw and numerous other musical figures, including the legendary harmonica player Larry Adler, the folksinger Burl Ives, former Library of Congress folklorist Alan Lomax and The New York Times music critic Olin Downes. The evidence of Communist leanings offered in Red Channels included Lena Horne's appearance on the letterhead of a South African famine relief program, Aaron Copland's appearance on a panel at a 1949 Scientific and Cultural Conference for World Peace and Leonard Bernstein's affiliation with the Committee to Re-Elect Benjamin J. Davis, a black, socialist New York City councilman. January 27 The Illinois Supreme Court reverses the Illinois Appellate Court and the Circuit Court of Cook County's grant of Injunctive Relief in favor of the Village of Skokie and against the Nazi group headed by Frank Collin. The Nazis are free to March in Skokie pending resolution of the federal lawsuit filed by the ACLU on behalf of the Nazis. (Case No. 49769, Illinois Supreme Court). February 23 Judge Bernard Decker of the United States District Court for the Northern District of Illinois issues an order ruling that the three ordinances adopted by the Skokie Village Board aimed at preventing Frank Collin and his Nationalist Socialist party sympathizers from marching in Skokie are unconstitutional as 'violative' of the 1st Amendment to the U.S. Constitution. (Skokie Life, April 9, 1978, p. 1). April 6 The United States Court of Appeals for the 7th Circuit, sitting en banc, vacates all previous "stay orders" and orders an expedited briefing schedule. (Application for Stay of Mandate, Harvey Schwartz & Gilbert Gordon, filed in the United States Supreme Court, No. 77-1736, on behalf of the Village of Skokie, p. 2 /Archives, Skokie Historical Society). April 11 Frank Collin and his band of Nazis apply to the Village of Skokie for a permit to conduct a demonstration in front of Skokie's Village Hall on Sunday, June 25, 1978. (Application for Stay of Mandate, Harvey Schwartz & Gilbert Gordon, filed in the United States Supreme Court, No. 77-1736, on behalf of the Village of Skokie, p. 2 / Archives, Skokie Historical Society). May 22 The United States Court of Appeals for the 7th Circuit affirms Judge Decker's February 23, 1978 ruling that the three ordinances adopted by the Skokie Village Board aimed at preventing Frank Collin and his Nationalist Socialist party sympathizers from marching in Skokie are unconstitutional as violative of the 1st Amendment to the U.S. Constitution. (Opinion, U.S. Court of Appeals, Nos. 78-1381 & 78-1385, Judges Pell, Sprecher (concurring in part and dissenting in part) and Wood, Archives, Skokie Historical Society). May 25 The Village of Skokie issues a permit allowing Frank Collin and his band of Nazi sympathizers to demonstrate in front of Skokie's Village Hall on Sunday, June 25, 1978. (Application for Stay of Mandate, Harvey Schwartz & Gilbert Gordon, filed in the United States Supreme Court, No. 77-1736, on behalf of the Village of Skokie, p. 2 / Archives, Skokie Historical Society). June 2 The United States Court of Appeals, 7th Circuit, enters an order denying the Village of Skokie's request for a stay of mandate. Application for Stay of Mandate, Harvey Schwartz & Gilbert Gordon, filed in the United States Supreme Court, No. 77-1736, on behalf of the Village of Skokie, p. 3 / Archives, Skokie Historical Society). June 5 The Village of Skokie files its Petition for Writ of Certiorari in the United States Supreme Court requesting review of the opinion of the United States Court of Appeals 7th Circuit, rendered in the Nazi case. (Application for Stay of Mandate, Harvey Schwartz & Gilbert Gordon, filed in the United States Supreme Court, No. 77-1736, on behalf of the Village of Skokie, p. 3). June 22 Skokie Police Chief Kenneth Chamberlain issues a directive that the area bounded by Edens Highway, Howard Street, Skokie Blvd. and Main Street will be cordoned off to vehicular traffic on June 25. Only residents may enter into the cordoned off area. All vehicles will be subject to cursory searches for weapons. (Archives, Skokie Historical Society, 1983.36.4). June 23 Frank Collin and his band of Nazi sympathizers cancel their planned demonstration in Skokie scheduled for June 25. (Statement by Mayor Albert J. Smith dtd. June 23, 1978, Archives, Skokie Historical Society). June 25 The date on which Frank Collin and his band of Nazi sympathizers are to march in front of Skokie's Village Hall. The march is called off when the City of Chicago relents and permits the group to march in Marquette Park on July 9. (Skokie Life, February 12, 1981, Sec. 1-B, p. 3 / Archives, Skokie Historical Society). Otto Bradfisch [was] born on 10.05.1903, in Zweibrücken, Rheinland. He was an economist, a jurist, an SS Obersturmbannführer, Leader of Einsatzkommando 8 of Einsatzgruppe B of the Security Police and the SD. Bradfisch joined the NSDAP (membership no. 405 869). At the time he was studying in Munich, he was working as the acting local group leader. Bradfisch applied for service in the Gestapo, into which he was hired on 15.03.1937 and was attached to Einsatzgruppe B of the Security Police and the Sicherheitsdienst in June 1941. Einsatzgruppe B was one of four Einsatzgruppen deployed for special operations during Operation Barbarossa, the attack on the Soviet Union. Disclaimer: This site includes diverse and controversial materials—such as excerpts from the writings of racists and anti-Semites—so that its readers can learn the nature and extent of hate and anti-Semitic discourse. It is our sincere belief that only the informed citizen can prevail over the ignorance of Racialist "thought." Far from approving these writings, this site condemns racism in all of its forms and manifestations. Fair Use Notice: This site may contain copyrighted material the use of which has not always been specifically authorized by the copyright owner. We are making such material available in our efforts to advance understanding of historical, political, human rights, economic, democracy, scientific, environmental, and social justice issues, etc. We believe this constitutes a "fair use" of any such copyrighted material as provided for in section 107 of the US Copyright Law. In accordance with Title 17 U.S.C. Section 107, the material on this site is distributed without profit to those who have expressed a prior interest in receiving the included information for research and educational purposes. If you wish to use copyrighted material from this site for purposes of your own that go beyond 'fair use', you must obtain permission from the copyright owner. Please Note: The list-owner and moderators of 3rdReichStudies are not responsible for, and do not necessarily approve of, the random ads placed on our pages by our web server. They are, unfortunately, the price one pays for a 'free' website.